Pasión y Arte is an all-female flamenco dance company. 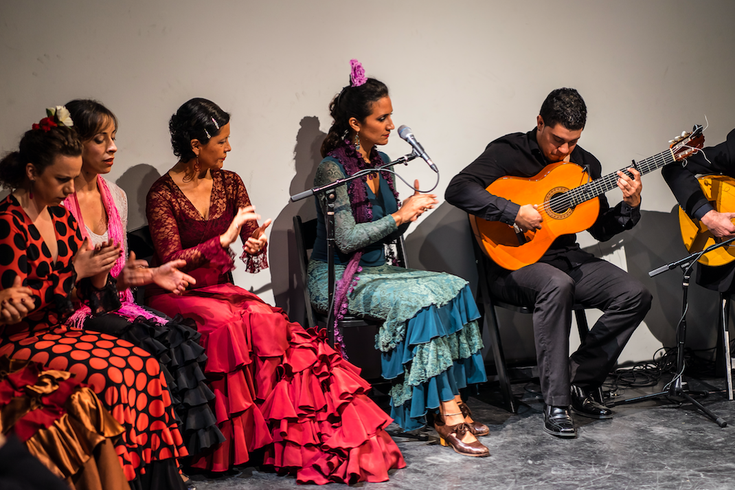 The second Tablao Philly series performance will begin Thursday, Jan. 28, featuring the Philadelphia and New York City-based flamenco ensemble Pasión y Arte. The all-female, feminist flamenco company will showcase special guest Almudena Serrano, who is a Spanish flamenco star. Ensamble De Luna a Lunares will also perform during the evening. Tablao is a Spanish term that refers to cafe-like venues where flamenco takes place. Diverse audiences would gather to drink, eat, listen to music and enjoy the dancing there. At the Tablao Philly event, that environment will be re-created in the Asian Arts Initiative on Vine St. The dancers will present their unique, personal interpretations of the flamenco art form, tapas will be served and wine will be available. Each performance will be 90-minutes long with two 10-minute intermissions for the audience to enjoy the tapas and wine. Guests can choose to purchase tickets for only the performance or upgrade to a $35 ticket that includes tapas and two glasses of wine.